Download OP Financial Group's Corporate Governance Statement 2016 here. This is a description of OP Financial Group's Corporate Governance Statement. By law, a credit institution and a securities issuer shall present its corporate governance system. OP Financial Group’s issuers (OP Corporate Bank plc and OP Mortgage Bank) prepare their own Corporate Governance Statements which substantially follow that of OP Financial Group. This OP Financial Group statement applies to credit institutions within the central cooperative consolidated, such as OP Process Services Ltd and OP Card Company Plc, excluding the abovementioned issuers. OP Financial Group member cooperative banks will publish their own corporate governance statements. This Corporate Governance Statement of OP Financial Group has been prepared in accordance with the Act on Credit Institutions (CRD IV/CRR) and Chapter 7, Section 7 of the Finnish Securities Markets Act, and Recommendation 54 of the Finnish Corporate Governance Code (2015) where applicable. The Statement has been issued separately from the Report by the Board of Directors. This Statement also covers some other key governance issues and the related, up-to-date information is available on OP’s website. OP Financial Group's Executive Board discussed this Corporate Governance Statement on 31 January 2017. The Audit Committee of OP Financial Group's Supervisory Board also assessed the Statement at its meeting. KPMG Oy Ab, the Group’s auditor, has verified that the Statement has been issued and that the description it contains covering the main features of internal control and risk management systems related to the financial reporting process is consistent with the financial statements. This Statement plus OP Financial Group's financial statements, Report by the Executive Board, Auditor's Report and Annual Review are available on OP's website. In their decision-making and corporate governance, OP Financial Group and its central cooperative, OP Cooperative, Financial Group, comply with the laws of Finland and standards issued by virtue of them. OP Financial Group’s operations are specifically governed by the Act on the Amalgamation of Deposit Banks (Laki talletuspankkien yhteenliittymästä), the Act on Cooperative Banks and Other Cooperative Institutions, the Act on Credit Institutions, the Insurance Companies Act and the Co-operatives Act. Taking into account the specific characteristics of the cooperative system, OP Financial Group’s Corporate Governance conforms, whenever applicable, with the Finnish Corporate Governance Code approved by the Securities Market Association in October 2015. In addition, OP Financial Group follows the Code of Business Ethics in its operations. Established in 1902, OP Financial Group is a cooperative financial services group formed by independent cooperative banks and the Group’s central cooperative with its subsidiaries operating under the principle of joint and several liability. OP Financial Group’s success lies in a strong foundation of promoting the prosperity, well-being and security of its owner-members, customers and business partners. Being a Finnish Group is an important part of its identity. OP Financial Group consists of 173 indpendent member cooperative banks as of 31 December 2016 and the central cooperative they own, OP Cooperative, with its subsidiaries and affiliates. The Group’s operations are based on the cooperative principle – cooperation and sharing the fruits of success with everyone. Based on its mission, OP Financial Group creates sustainable prosperity, security and wellbeing for its owner-customers and in its operating region by means of its strong capital base and efficiency. OP Financial Group has three business segments: Banking, Non-life Insurance and Wealth Management. The amalgamation of OP Financial Group member cooperative banks is formed by OP Cooperative (central cooperative), companies belonging to its consolidation group, the central cooperative’s member credit institutions and companies belonging to their consolidation groups, and credit institutions, financial institutions and service companies in which the abovementioned institutions jointly hold more than half of the voting rights form the amalgamation. OP Financial Group is comprised of the amalgamation of the member cooperative banks and those non-amalgamation entities of which entities belonging to the amalgamation hold more than half of the total votes. The extent of OP Financial Group differs from that of the amalgamation of the member cooperative banks in that OP Financial Group subsumes companies other than credit and financial institutions or service companies. The most important of these are the insurance companies with which the amalgamation forms a financial and insurance conglomerate. In addition, Pohjola Health Ltd, a hospital, belongs to OP Financial Group. More detailed information on the legal structure of OP Financial Group and the amalgamation of the member cooperative banks can be found in the Financial Statements of OP Financial Group. The amalgamation of the member cooperative banks does not form a corporate group, as referred to in the Accounting Act, or a consolidation group, as referred to in the Act on Credit Institutions. The central cooperative of the amalgamation prepares consolidated financial statements as referred to in Section 9 of the Act on the Amalgamation of Deposit Banks. Group member cooperative banks are independent, local deposit banks engaged in retail banking. They provide modern and competitive banking services to households, SMEs, agricultural and forestry customers and public-sector entities. Helsinki Area Cooperative Bank, which began to operate as a cooperative deposit bank on 1 April 2016, is engaged in corresponding retail banking In the Helsinki Metropolitan Area. In terms of the type of their business organisation, the member cooperative banks are cooperatives whose basic values underlying decision-making include the one member, one vote principle. 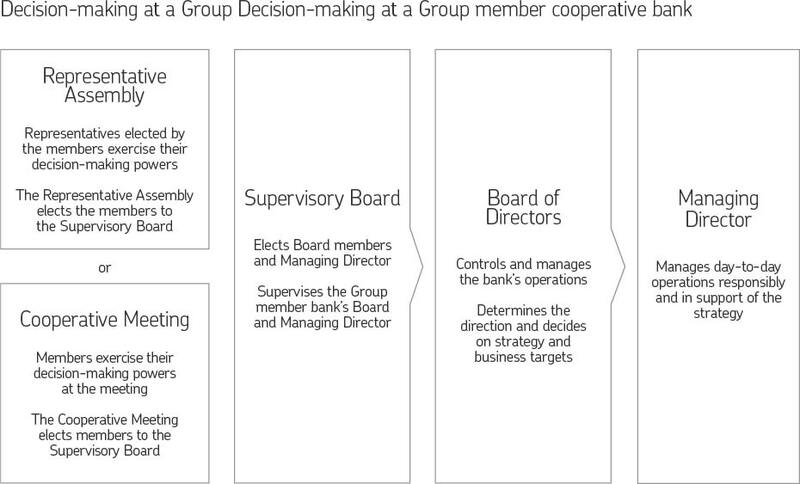 Within the member cooperative banks, the highest decision-making body is the assembly comprising owner-members or the cooperative meeting, which elects a Supervisory Board for the bank. The Supervisory Board in turn elects an Executive Board for the bank. The central cooperative’s Supervisory Board has confirmed the Principles of Good Corporate Governance for the Group, covering, for example, a cooperative bank’s administrative bodies and executive management, internal control and remuneration. The cooperative bank federations are regional cooperation bodies for the member cooperative banks. Finland is divided into 16 federations of cooperative banks and the boundaries of the federations essentially follow those of provinces. The federations nominate candidates in their region for the OP Cooperative Supervisory Board. In addition, the cooperative bank federations cooperate, for example, in projects related to marketing, corporate social responsibility and internal training. The meeting of a cooperative bank federation comprising member cooperative banks shall elect the Executive Board to represent the federation and attend to its affairs. According to corporate governance recommendations, the Executive Board consists of a minimum of three (3) and a maximum of nine (9) members elected annually. The central cooperative of OP Financial Group is OP Cooperative and OP Andelslag in Swedish and is domiciled in Helsinki. Within the central cooperative, the highest decision-making powers rest with the Cooperative Meeting and the Supervisory Board elected by it and operational decision-making powers are exercised by the Executive Board elected by the Supervisory Board and being made up of management executives. The central cooperative’s member banks own OP Cooperative. The central cooperative’s members may include credit institutions, as referred to in the Act on the Amalgamation of Deposit Banks, whose Bylaws or Articles of Association have been approved by the central cooperative. The Supervisory Board takes decisions on admitting new members. The purpose of the central cooperative as the central cooperative of the amalgamation and as the company heading the financial and insurance conglomerate formed by OP Financial Group is to equitably contribute to and support the development of, and cooperation between, its member credit institutions, other OP Financial Group companies and entities and the entire OP Group. To that end, the central cooperative controls the Group's centralised services, develops the Group's business, manages the Group's strategic control and lobbying and manages control and supervision duties belonging to the central cooperative of the amalgamation and the company heading the financial and insurance conglomerate. Furthermore, the central cooperative acts as OP Financial Group's strategic owner institution. OP Financial Group has a long-term approach to planning the composition of administrative bodies. Effective work in administrative bodies requires that their members have sufficiently diverse expertise, skills and experience. In preparing the selection of members of the administrative bodies, attention is paid to the person’s added value to the body’s composition in terms, for example, of fostering adequate diversity. Diversity is fostered by ensuring that the candidates have a wide range of knowledge, skills and experience, as well as the comprehensive representation of various regions and the balanced representation of genders and age groups on the administrative bodies. The aim is that the central cooperative’s Supervisory Board and member cooperative banks’ supervisory boards and boards of directors are represented by both genders in proportion of 60/40. To that end, the Group seeks to ensure on a long-term basis that of the candidates with equal strengths in terms of skills and experience are nominated a member of an administrative body who represents a gender that is minority on the administrative body. 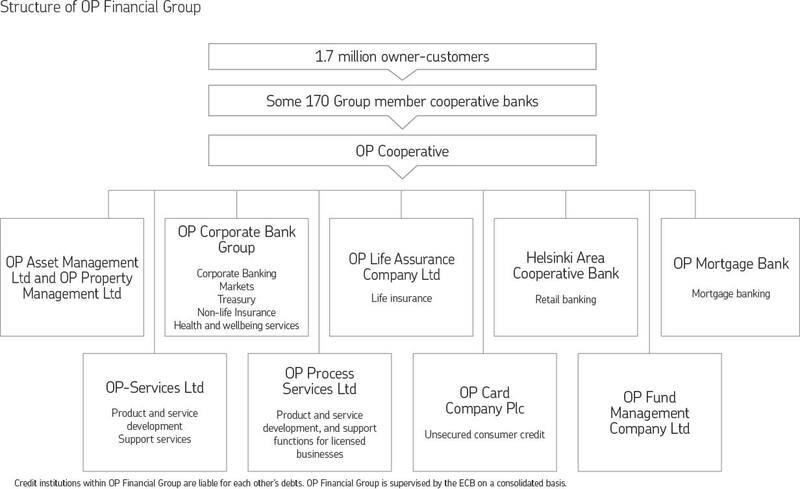 OP Financial Group's consolidated financial statements at the end of 2016 included the accounts of 173 member cooperative banks (178) including Group companies, OP Cooperative Consolidated and OVY Insurance Ltd.
During 2016, the mergers of member cooperative banks reduced the number of OP cooperative banks while the conversion of Helsinki OP Bank Ltd’s legal form into a cooperative bank registered on 1 April 2016 increased the number. The bank's new business name is Helsinki Area Cooperative Bank (OP Helsinki). OP Helsinki as subsidiary is part of OP Financial Group central cooperative consolidated. The central cooperative will continue to have a major role in capitalising the new bank, which is why OP Cooperative exercises control over OP Helsinki, according to OP Helsinki's Bylaws. On 30 November 2016, OVY Insurance Ltd transferred a banking special insurance portfolio to OP Insurance Ltd, consisting of special banking insurance policies issued as general liability and crime insurance as well as legal expenses insurance for OVY Insurance Ltd’s senior management and administrative staff. Östra Korsholms Andelsbank merged into Vasa Andelsbank on 29 February 2016. On 31 October 2016, Keiteleen Osuuspankki merged into Pielaveden Osuuspankki, changing its name to Nilakan Seudun Osuuspankki. On 31 December 2016, Enon Osuuspankki, Kiihtelysvaaran Osuuspankki and Tuupovaaran Osuuspankki merged into Ilomantsin Osuuspankki, changing its name to Vaara-Karjalan Osuuspankki. On 31 December 2016, Puolangan Osuuspankki merged into Suomussalmen Osuuspankki, changing its name to Ylä-Kainuun Osuuspankki. Pielisen Osuuspankki and Pohjois-Karjalan Osuuspankki accepted a merger plan on 10 October 2016, according to which the former will merge into the latter. The planned date for registration of the merger is 31 March 2017. Karjalan Osuuspankki and Mynämäen-Nousiaisten Osuuspankki accepted a merger plan on 15 December 2016, according to which the former will merge into the latter. The planned date for registration of the merger is 30 April 2017. Vetelin Osuuspankki and Kaustisen Osuuspankki accepted a merger plan on 21 November 2016, according to which the former will merge into latter. At the same time, Kaustisen Osuuspankki will be renamed Perhonjokilaakson Osuuspankki. The planned date for registration of the merger is 31 May 2017. Vetelin Ylipään Osuuspankki and Halsuan Osuuspankki accepted a merger plan on 28 November and 29 November 2016, according to which the former will merge into the latter. At the same time, Halsuan Osuuspankki will be renamed Halsua-Ylipään Osuuspankki. The planned date for registration of the merger is 30 June 2017. Oriveden Seudun Osuuspankki and Mäntän Seudun Osuuspankki accepted a merger plan on 29 December 2016, according to which the former will merge into latter. At the same time, Mäntän Seudun Osuuspankki will be renamed Pohjois-Hämeen Osuuspankki. The planned date for registration of the merger is 30 June 2017. UAB "Pohjola Finance" became UAB "OP Finance"
Omasairaala Oy was renamed Pohjola Health Ltd when the Tampere hospital unit was opened on 1 August 2016. The Cooperative Meeting is OP Cooperative's highest decision-making body. The Annual Cooperative Meeting deals with issues mentioned in Section 7 of the central cooperative’s Bylaws, such as the adoption of the parent and consolidated income statement and balance sheet for the previous financial year, and the election of members of the Supervisory Board and an auditor. Held in OP Cooperative’s registered office in Helsinki before the end of May (in practice in March), the Annual Cooperative Meeting shall be convened by the Supervisory Board. An Extraordinary Cooperative Meeting shall be held whenever the Supervisory Board deems it appropriate or whenever it must be held by law. The Meeting is attended by the representatives of the central cooperative's member banks. Notice of the Cooperative Meeting shall be brought to the attention of members in writing or using an electronic communication channel no earlier than two months and no later than one week prior to the final registration date. In calculating the votes cast at the Meeting, members exercise their voting rights, based on cooperative contributions, equalling their shares in the central cooperative. Member cooperative banks with a good financial standing have additional votes as stipulated in greater detail in the central cooperative’s Bylaws. However, no single member may cast more than two per cent of the votes represented at the Meeting. At the Annual Cooperative Meeting, a member has only one vote if, due to its own financial difficulties, it has received financial support based on a resolution passed by OP Cooperative, which fulfils the characteristics specified in Section 8 of the central cooperative’s Bylaws. OP Cooperative held its Annual Cooperative Meeting in Helsinki on 15 March 2016. The Meeting adopted the financial statements for 2015, discharged those accountable from liability and elected persons as required. Furthermore, the Meeting decided to alter the cooperative’s Bylaws and the cooperative’s donations. The Committee is tasked with preparing and discussing proposals to the central cooperative's Cooperative Meeting on the Chair of the Cooperative Meeting, remuneration payable to the Supervisory Board Chair, deputy Chairs, the number of Supervisory Board members, new candidates for Supervisory Board members presented to the Cooperative Meeting as well as on the election of an auditor and its remuneration. In addition, the Nomination Committee proposes to the Supervisory Board on member nominees to the Representative Assembly of Helsinki Area Cooperative Bank representing the central cooperative. The Committee has 16–32 members and each Federation of Cooperative Banks is represented by one or two members in the Committee. In the composition of the Supervisory Board and its members' competence requirements, OP ensures that the members have adequate experience and professional skills to perform their duties professionally and carefully. Supervisory Board members must have adequate knowledge of the financial sector. In the competence requirements, OP also ensures that the Supervisory Board is diverse and has adequate corporate social responsibility knowledge. In accordance with the Bylaws, the central cooperative’s Supervisory Board has a minimum of 32 and a maximum of 36 members elected by the Cooperative Meeting. A minimum of 16 and a maximum of 20 members shall be elected to the Supervisory Board in such a way that the Supervisory Board has at least one member from each of the 16 cooperative bank federation regions. These members' term of office is three years, and of these members the number closest to one third resigns each year. Another 16 members come from areas covered by the Federation of Cooperative Banks with the number of members from the member banks involved determined on the basis of their capital adequacy. The term of office of these members is three years unless the term of office ends prior to this date due to a change in the allotment of the seats among the federations. The Supervisory Board comprised 34 members on 31 December 2016. An administrative officer or salaried employee may not be elected to the Supervisory Board from a member bank which, pursuant to Section 8 of OP Cooperative’s Bylaws, has only one vote at Cooperative Meetings, i.e. which has received financial support referred to in said section. A person who is 68 years of age or older is not eligible for Supervisory Board membership. However, a member who turns 68 years of age during his membership may sit on the Supervisory Board until the closing of the next Cooperative Meeting. Under OP Cooperative’s Bylaws, the Supervisory Board shall supervise the central cooperative’s corporate governance, managed by the Executive Board and the CEO, and ensure that the central cooperative’s operations are managed in a professional and prudent manner in accordance with the Co-operatives Act and in the best interests of the central cooperative and OP Financial Group. In addition, the Supervisory Board shall, for example, confirm OP Financial Group’s strategy and other shared goals and policies, the central cooperative's operational and financial targets, appoint and discharge the President and Group Executive Chairman acting as the CEO of the central cooperative and other Executive Board members and deputy members and the Chief Audit Executive. Discuss and decide on the appointment of the Group-level working groups of strategic significance. At its first meeting after the Annual Cooperative Meeting, the Supervisory Board shall elect from among its members a Chair and two Vice Chairs until the closing of the next Annual Cooperative Meeting. The presiding officers of the Supervisory Board comprise the Chair and both Vice Chairs of the Supervisory Board. Holding their meeting whenever necessary, the presiding officers communicate to the Executive Board Chair and Vice Chair in respect of important and far-reaching strategic issues relevant to OP Financial Group and the central cooperative consolidated as well as to OP Financial Group’s HR directors in HR issues in which the Executive Board is disqualified. Convened by the Chair or, whenever he is prevented, the Vice Chair, the Supervisory Board meeting is primarily held 6–7 times a year. The Supervisory Board meeting has a quorum when more than half of its members are present. Items on the meeting agenda are primarily prepared by OP Cooperative's Executive Board and primarily presented by the Chair or Vice Chair of the Executive Board. Items on the Supervisory Board meeting agenda are also in the first place discussed in advance by the Supervisory Board Working Committee or by other Supervisory Board committees. Members and deputy members of OP Cooperative's Executive Board, the Chief Audit Executive and four separately appointed employee representatives and their deputies, if any, have also the right to be present and speak at Supervisory Board meetings. In addition, the Supervisory Board confirms operating principles regarding OP Financial Group. The Supervisory Board had seven meetings in 2016. Jaakko Pehkonen acted as its Chair and Mervi Väisänen and Olli Tarkkanen as its Vice Chairs. The average attendance rate of members stood at 95%. Discussed OP Financial Group’s organisation in terms of regulatory and public affairs. At its spring 2016 regrouping meeting, the Supervisory Board elected, from among its members, members for a one-year term to the following five committees: Working Committee, Audit Committee, Remuneration Committee and Risk Management Committee as well as the Nomination Committee of the central cooperative consolidated Executive Board. In addition, the presiding officers have a status comparable with a committee. Acting as bodies supporting the Supervisory Board, as a rule the committees have no independent decision-making powers. The Supervisory Board also appoints, from among its members, members of the committees reporting to it and the Chair and Vice Chairs of the Audit Committee and the Risk Management Committee, and confirms the rules of procedure for the committees. The Working Committee comprises the Supervisory Board’s Chair and Vice Chairs and six other Supervisory Board members annually appointed from among Supervisory Board members. Chaired by the Supervisory Board’s Chair, the Working Committee is tasked with assisting the Supervisory Board in the preparation of OP Financial Group's strategy and in the monitoring of its implementation, participating in the preparation of significant projects and initiatives in the pipeline within the Group and taking charge of their monitoring. The Working Committee also considers major issues related to cooperation within the Group and the implementation of the Group's operating principles. Issuing recommendations to the Executive Board in strategic matters relating to OP Financial Group, if desired. Convened by its Chair, the Working Committee meets 8–11 times a year. The central cooperative's Executive Board prepares the meeting agenda. The Working Committee had eight meetings in 2016. The average attendance rate of members stood at 97%. In addition to the Committee members, the Working Committee meetings were attended by the Chair and Vice Chair of the Executive Board and the secretary of the Supervisory Board acted as the meeting secretary. The meetings prepared matters to be discussed at Supervisory Board meetings and examined other important preparatory issues applying to the Group. During its regrouping meeting, the Supervisory Board elects, from among its members, four members to the Audit Committee for a one-year term and appoints from amongst them a Chair, Vice Chair and three managing directors of OP cooperative banks to act as permanent expert members for a term of three years or until the end of the term of the Supervisory Board.An Audit Committee member with an employment or executive contract with the Group may not be involved in the daily management of a credit institution whose affairs belong to the Committee's duties. At least one Committee member who has adequate expertise in accounting or audit must be outside of OP Financial Group. The Audit Committee must have adequate expertise in accounting, book-keeping, financial reporting and accounting practices as well as internal audit. The Chair of the Committee must have special knowledge and experience in the application of accounting policies and internal control processes. The Audit Committee is tasked with assisting the Supervisory Board to ensure that the central cooperative consolidated and OP Financial Group have in place an adequate and well-functioning control system to cover all operations and that the central cooperative consolidated’s and OP Financial Group's accounting and financial management control is organised appropriately. The Committee is also tasked with monitoring that the central cooperative consolidated’s and OP Financial Group's activities and internal control are organised in accordance with the requirements of the laws and regulations and the principles of good corporate governance, in addition to supervising the performance of internal audit. The Audit Committee also helps the Supervisory Board in ensuring that the central cooperative consolidated is managed in an expert and prudent manner that promotes the competitiveness and success of OP Financial Group. Dealing with and assess matters related to auditing and auditors. The Audit Committee has mainly four meetings a year. The Audit Committee had six meetings, with the average attendance rate of members standing at 92%. In addition to members and expert members, the meetings were attended by the auditor representatives and the Chair of OP Cooperative’s Executive Board, Executive Board member in charge of finance and the Chief Audit Executive. The Remuneration Committee comprises the Supervisory Board Chair, Vice Chair as his first deputy and a maximum of other three members annually appointed by the Supervisory Board. 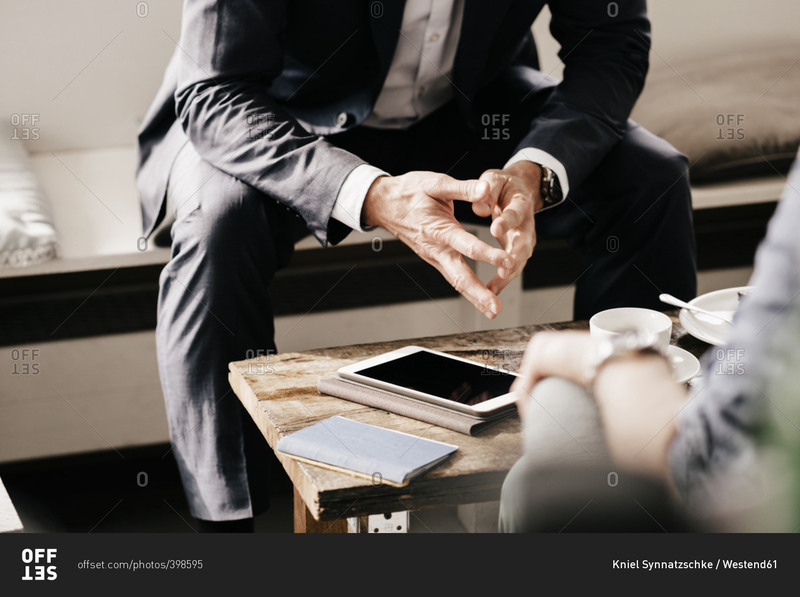 A person included in the Supervisory Board, who has no employment or executive contract with an OP Financial Group company, may be a Committee member. 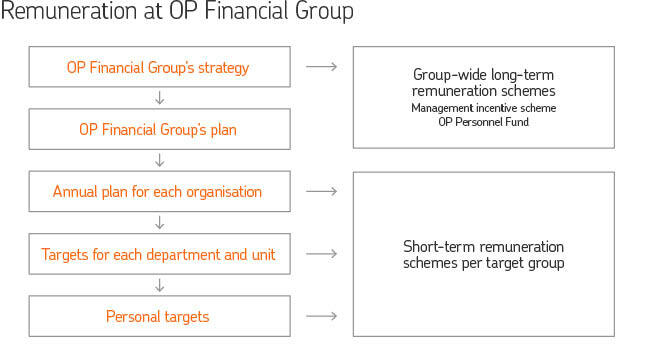 The Remuneration Committee is tasked, for example, with controlling and supervising the development of management and employee remuneration within OP Financial Group, assessing the performance of remuneration schemes in order to ensure that remuneration is in line with the Group's core values, strategy, objectives, risk policies and control system, and assessing incentives under the remuneration schemes and other effects on the management of risks, capital and liquidity. In addition, the Committee confirms, for instance, the performance metrics for OP Financial Group's personnel fund and their outcome, and confirms those included in the Group’s long-term management remuneration scheme and the amount of earned bonuses. Confirms annually recommendations for management and administration remuneration. The Remuneration Committee had 12 meetings in 2016. The average attendance rate of members stood at 98%. Committee members included the Supervisory Board Chair, Vice Chair as his first deputy and Annukka Nikola, Ilmo Aronen and Seppo Kietäväinen. In addition to the Remuneration Committee members, OP Financial Group's Executive Vice President of Human Resources participated in Committee meetings. The Supervisory Board elects from among its members four Risk Management Committee members for a one-year term, who have the required expertise related to the credit institution's and OP Financial Group's risk-bearing capacity and the Group's risk policies based on the strategy, and appoints from among the Committee members a Chair and Vice Chair as well as three separately appointed member cooperative banks’ managing directors as permanent expert members from among Supervisory Board members. At least one of the Committee members must be outside of OP Financial Group. The Risk Management Committee assists the Supervisory Board in matters related to the central cooperative consolidated’s and Group's risk-taking and risk management, as well as risk-based supervision, in order to ensure that the executive management conforms to the risk-taking policy laid out in the Group strategy and the risk limits decided by the Supervisory Board. The Risk Management Committee assists the Supervisory Board in ensuring that an adequate risk management system is in place and that no exposure is so large that it can jeopardise business continuity, capital adequacy, liquidity and strategy implementation. The Committee must assess whether the prices charged for services that tie the capital of the central cooperative and its consolidation group are in line with their business model and strategic risk policies and, if this is not the case, draw up a plan to make corrections. The Committee must assist the Supervisory Board's Remuneration Committee in creating sound remuneration schemes. Monitors Group member cooperative banks' risk categories, the performance of the Executive Board's ALM and Risk Management Committee, risk assessments issued by the regulator, the development of the regulatory framework related to the Group in respect of risk management. The Risk Management Committee had six meetings in 2016. The average attendance rate of members stood at 97%. In addition to members and the secretary, the Committee meetings have been attended by the Chairman of OP Cooperative's Executive Board, Executive Board member in charge of risk management and Executive Board member in charge of finance. The central cooperative consolidated management Nomination Committee comprises the Supervisory Board’s Chair, the first Vice Chair and, based on the Supervisory Board’s decision, one or more Supervisory Board members. The Committee prepares proposals to the Supervisory Board on the nomination of the central cooperative’s Executive Board members, the Chief Audit Executive and Compliance Officer, including the job descriptions, as well as the related checks and terminations. Furthermore, the Committee decides on the revision of the salaries and emoluments of the Executive Board members and the Chief Audit Executive as well as on remuneration. The Nomination Committee assesses the fitness and propriety of Executive Board members, Chief Audit Executive and Chief Compliance Officer and deals with the succession plans of Executive Board members and the Chief Audit Executive. The committee assists the Supervisory Board, for example, in the assessment of the collective knowledge, skills, experience and diversity of the Executive Board and the time commitment expected of its members, in the assessment of the composition, work and an individual member of the Executive Board as well as in the assessment of the selection criteria and procedures applied to the executive management. The management Nomination Committee had three meetings in 2016. The attendance rate of members stood at 100%. The Chairman (President and Group Executive Chairman) of the central cooperative's Executive Board is responsible for managing OP Financial Group, the central cooperative and the central cooperative consolidated and is in charge of their strategic control in accordance with the strategic intent confirmed by the Supervisory Board. He is also tasked with presiding over Executive Board meetings and ensuring that the Executive Board works effectively and sees to it that it performs all duties within its remit. The President and Group Executive Chairman also chairs the boards of directors of central cooperative consolidated credit institutions engaged in corporate banking as well as in the Helsinki Metropolitan Area in retail banking, non-life insurance company and asset management company as well as OP-Services Ltd and OP Process Services Ltd.
As the central cooperative's CEO, he has statutory responsibility for the central cooperative's management at operational level according to the instructions and regulations issued by the Supervisory Board and the Executive Board. The Supervisory Board appoints the President and Group Executive Chairman, acting as the central cooperative's CEO, and decides on the terms and conditions of his executive contract. Specifically approved by the Supervisory Board, the job description of the President and Group Executive Chairman defines his main responsibilities. Reijo Karhinen, M.Sc. (Econ. & Bus. Adm.) and vuorineuvos (Finnish honorary title), acts as the President and Group Executive Chairman of OP Financial Group. He has held that position since 2007. Information on the remuneration payable to the President and Group Executive Chairman can be found in the section covering remuneration below. The central cooperative's Executive Board acting as the board of directors comprises a Chairman acting as CEO and known as President, Group Executive Chairman; his deputy who acts as Vice Chairman of the Executive Board; and a minimum of four and a maximum of nine other members and a maximum of four deputy members, depending on the Supervisory Board’s decision. An Executive Board member and deputy member must have adequate knowledge of the financial sector, financial matters and general knowledge of the business of the central cooperative and consolidation group and OP Financial Group and other qualifications required for the position. The President and Group Executive Chairman and other Executive Board members and deputy members as well as the Chief Audit Executive shall be appointed and discharged by the Supervisory Board, which shall also decide on the division of responsibilities between the members. The term of office of an Executive Board member or deputy member and the Chief Audit Executive is for the time being, but for a maximum period up to the member’s retirement age in accordance with OP Financial Group’s pension scheme. The term of office may end prior to this date if the member or deputy member requests to resign or is dismissed from membership. The Executive Board is responsible for managing the central cooperative’s and its consolidation group's operations in accordance with the Co-operatives Act, other laws, official regulations and the central cooperative Bylaws. The Executive Board must be careful in promoting the interests of OP Financial Group, its central cooperative and its consolidation group. The Executive Board duties, according to its role, cover those related to OP Financial Group's steering, the management of the central cooperative consolidated and the management and administration of the parent entity (central cooperative) of the central cooperative consolidated. Confirming the rules of procedure of OP Financial Group’s Risk Management Committee and Credit Risk Committee and appointing their members. The description of internal control and supervision of the adequacy of internal control performance in companies. The central cooperative consolidated’s management and decision-making system. Technical bases for equalisation provisions and their changes. Preparing the central cooperative's financial statements and Report by the Executive Board and submitting them to the Supervisory Board. In addition, the Executive Board must assess and supervise the appropriateness, scope and reliability of the Group's capital adequacy management, decide on reporting with which the Executive Board monitors the business, risk-bearing capacity, risk status and internal control of the Group and its subsidiaries. At its meeting, the Executive Board decides on the matters within its remit. The Executive Board may hold a meeting on a teleconference basis or using other communications media if the matter in question is urgent or there exists some other similar reason to do so. Executive Board members must be given the opportunity to communicate with each other during decision-making. Convened by the Chairman or, whenever his is prevented, the Vice Chairman, an Executive Board meeting is mainly held once a week. The Executive Board's ordinary members and deputy members participate in the meetings. OP Financial Group's Chief Audit Executive has the right to be present and speak at Executive Board meetings. Executive Board meetings may also be attended by some other person whose presence is necessary due to the matter under discussion. The meeting’s agenda and the basic meeting material shall be distributed to the Executive Board’s members for review well in advance prior to the meeting. Each Executive Board member and deputy member shall present items on the meeting agenda within his/her remit. In this context, he/she may be assisted by an expert staff member or another expert. Proposals must be given in writing. Each Executive Board member and deputy member is responsible for the implementation of the execution of Executive Board decisions within his/her remit and supervises their implementation. Minutes shall be kept of all Executive Board meetings, containing those present, decisions made and any dissenting opinions, by the secretary appointed by the Executive Board. The next Executive Board meeting adopts the minutes of the previous meeting and the minutes are signed by the secretary and the Executive Board members and deputy members present at the meeting. All minutes documents are numbered consecutively by calendar year. The Executive Board is collectively responsible for the matters upon which it decides jointly at its meetings. In addition, Executive Board members and deputy members bear operational responsibility for the areas of responsibility and organisational entities individually designated to them. Executive Board members must also give the company sufficient information to assess his/her fitness and propriety and independence, and inform of any changes in such information. The Executive Board shall prepare an annual action plan, containing a meeting schedule and the most important issues discussed at the meetings. The Executive Board shall review its performance and procedures on an annual self-assessment basis. The Executive Board had 49 meetings in 2016. The average attendance rate of members stood at 96%. At its meetings, the Executive Board also discussed, for instance, the annual plan, risk management and capital adequacy management principles and risk policies, and regularly analysed the financial performance, capital adequacy and risk exposure of OP Financial Group, the central cooperative consolidated and the business segments. The Executive Board also monitored key measures taken and the achievement of the targets. In addition, it discussed key issues related to markets, the competitive and regulatory environment and evaluated the effect of related changes on OP Financial Group. As part of its normal activities, the Executive Board also discussed all audit reports prepared in 2016 and other key issues pertaining to internal and external control. In 2016, it analysed regularly major purchases and projects. At its meetings in 2016, the Executive Board regularly discussed and reviewed issues related to competence development and remuneration. It also further developed its activities, for instance, by holding two two-day planning days. Outi Taivainen, OP Financial Group’s Executive Vice President for Human Resources and deputy member of the Executive Board, became member of the Executive Board on 1 April 2016. Markku Koponen, deputy Executive Board member, OP Financial Group’s Chief Legal Officer, resigned on 31 December 2016. The Executive Board has set up four committees whose rules of procedure it has confirmed. The Committees have no independent decision-making powers but the Executive Board makes decisions based on preparations by the committees. The central cooperative's Executive Board confirms the composition of the HR Committee and appoints its members. The Committee is chaired by the Chairman of the Executive Board. Other members acting as Executive Board members comprise OP Financial Group's Executive Vice President of Human Resources, Executive Vice President of Operations and one Executive Vice President of each business segment on a one-year rotation basis. Committee members must have adequate knowledge of OP Financial Group's and the central cooperative consolidated’s operations as well as of HR issues. The HR Committee is responsible for supporting the Executive Board in controlling the HR management of the central cooperative consolidated in accordance with the adopted principles and decisions. The Committee is tasked with assisting the Executive Board in ensuring that HR management supports the achievement of the business targets of the central cooperative consolidated by means of HR management methods, processes and their supporting systems. The Committee is also responsible for supervising the central cooperative consolidated that it complies in its operations with the agreed and decided HR policy guidelines. The HR Committee held 10 meetings in 2016. Its members comprised President and Group Executive Chairman, Executive Vice President of Operations, Executive Vice President of Human Resources and Executive Vice President of Wealth Management. The central cooperative's Executive Board confirms the composition of the Development Committee and appoints its members. The Committee is chaired by the Vice Chair of the Executive Board. Other members comprise Executive Vice President, Banking; Executive Vice President, Wealth Management; Executive Vice President, Non-life Insurance; Executive Vice President, Digital Business and New Businesses; and Executive Vice President, Group Steering. The Committee members must have adequate knowledge of the development activities within OP Financial Group and the central cooperative. The Committee is tasked with supporting the Executive Board in controlling and managing Group-level development. The central cooperative's Executive Board confirms annual development needs and the main policy lines for allocating OP Financial Group’s development investments. On the basis of the policy lines issued by the Executive Board, the Development Committee defines development priorities and allocates development investments to various development plans. The Committee controls the prioritisation between the development plans and the resulting development portfolios for the purpose of implementing the OP Financial Group strategy and achieving the targets deriving from the strategy. The Development Committee held 17 meetings in 2016. In 2016, the Committee held four longer meetings on the allocation of development spending: the April–May meetings discussed the existing plans for portfolios and the implementation capacity and the September–October meetings concentrated on identifying the most important conditions of the new strategy and initiating the required changes in 2017. OP Cooperative’s Executive Board confirms the composition of the Control and Compliance Committee and appoints its members. The Committee is chaired by the Chair of the Executive Board. Other members comprise the Executive Board member in charge of Group Steering and the Executive Board member in charge of Group risk management. If the Chair is prevented from being present, the Committee members shall select from among its members a chair of the meeting. The Committee is tasked with supporting the Executive Board in the central cooperative's implementation of control and supervision of the central cooperative consolidated and cooperative banks based on the principles issued by OP Cooperative's Supervisory Board. The Committee makes decisions on matters delegated to it by the Executive Board. The Control and Compliance Committee held 12 meetings in 2016. At its meetings, the Committee regularly discussed, for example, issues related to cooperative banks' risk categorisation and bank-specific control as well as groups of connected clients related to structural development and problem situations. In addition, the Committee put on the table issues related to cooperative banks' audits, control and corporate coherence within the Group as well as "All come along" reports. The Committee regularly received reports on how the project of transferring cooperative banks proceeded. After an alteration of its rules of procedure, the Committee’s duties was extended to cover the central cooperative consolidated’s control and supervision, the Committee regularly discusses the Group-level risk management processes, qualitative risks and the Internal Control observations analysis. The central cooperative's Executive Board confirms the composition of the ALM and Risk Management Committee and appoints its members. The Committee is chaired by the Chair of the Executive Board. Other members acting as Executive Board members comprise OP Financial Group's CFO, CRO, Executive Vice President of Banking and Executive Vice President of Group Steering. The Committee members must demonstrate adequate knowledge of the operations, capital adequacy management and ALM and risk management of the Group and the central cooperative consolidated. The ALM and Risk Management Committee supports the Executive Board in steering and managing the Group's risk-bearing capacity and risk appetite according to the operating principles and decisions issued by the Supervisory Board. The Committee is also tasked with assisting the Executive Board in ensuring that the central cooperative and its consolidation group have adequate capital adequacy management and risk management systems in place covering all operations. The Committee is also responsible for supervising the central cooperative and its consolidation group and the entire OP Financial Group so that they do not take excessive risks in their operations which would materially jeopardise the capital adequacy, liquidity and profitability of the central cooperative, its consolidation group and the entire Group. The Committee makes decisions on issues included in the rules of procedure and delegated to it by the Executive Board. The Committee also discusses matters submitted for decision by the Executive Board, those to be brought to the attention of the Executive Board and other matters within the remit of the Committee. The ALM and Risk Management Committee held 13 meetings in 2016. The central cooperative consolidated has no separate Group management team but the central cooperative's Executive Board attends to its tasks. OP Financial Group has defined core values guiding its operations, which, for their part, also serve as the Group’s code of ethics. The Group’s core values are as follows: People-first Approach, Responsibility, and Prospering together. In its operations, OP Financial Group also applies its Code of Business Ethics. The Code of Business Ethics provides an ethical framework for the conduct of all employees and members of governing bodies of OP Financial Group. In addition, ethics is guided by the general principles and guidelines governing the management of conflict-of-interest cases updated every year. These principles contain more detailed regulations and guidelines governing, for example, the identification and management of conflict-of-interest situations, compliance with good practice, acceptance of gratuities related to business, commitments and extramural activities of management and personnel, personal and related-party transactions and decisions, and measures required in a conflict-of-interest situation. OP Financial Group's core values are presented in greater detail on OP Financial Group's website. The Supervisory Board confirms the division of responsibilities between the Executive Board’s members while the Executive Board confirms the operational organisation of the central cooperative. Operational decision-making combines with legal decision-making through the Executive Board, whose control and supervisory responsibility covers the entire Group. In the entire central cooperative consolidated, decisions are made as extensively as possible at Group level by the central cooperative's Executive Board. The board of directors of each subsidiary discusses issues related to them primarily on the basis of the policy guidelines issued by the central cooperative's Executive Board or after hearing the Executive Board. The central cooperative's Executive Board decides on candidates for the subsidiaries' boards of directors, after which the board of directors is elected in a manner specified in the Articles of Association and laws in force from time to time. Basically, the subsidiaries' boards of directors comprise members of the central cooperative's Executive Board. Board members must demonstrate adequate knowledge of financial issues and the company's business or other qualifications required in the position as well as to have the opportunity to allow sufficient time to perform their duties. The rules of procedure of the subsidiaries' boards of directors describe the tasks that each board carries out. The boards of directors also annually draw up an action plan showing a meeting schedule and the most important items on each meeting's agenda. The boards of directors assess their performance and working methods on a regular basis. The operations manager of the subsidiary's Managing Director chairs the subsidiary's board of directors. Effective and reliable internal control forms the basis for compliance with sound and prudent business practices. Internal control refers to procedures or practices within an organisation to ensure that the organisation achieves the targets set in the strategy, uses resources economically and the information in support of management decisions is reliable. Internal control also ensures that risk management, custody of client assets and protection of property are adequately arranged. Conformance to regulations and approved ethics principles, too, are ensured through internal control. OP Financial Group’s internal control principles shall be approved by the central cooperative’s Supervisory Board. Internal controls cover all operations, involving all OP Financial Group entities and sites. The nature and extent of operations and, whenever necessary, special characteristics related to international operations are taken into consideration in specifying internal controls. Internal control covers all organisational levels. Internal control in its most extensive form primarily takes place at the operational level, characterised by continuous processes and forming part of daily routines. Internal control is complemented by the opportunity of anyone employed by OP Financial Group to report through an independent channel if they suspect that rules or regulations have been violated (whistle blowing). The board of directors of each OP Financial Group entity is tasked with ensuring that internal control is duly organised, taking account of the Group-wide internal control principles and the supplementary central cooperative guidelines. Each entity’s managing director and executive management are responsible for ensuring internal control execution in practice and that duties are duly segregated among employees. The centralised Compliance function, Risk Management and Finance and Treasury functions assist Group entities in ensuring internal control effectiveness. In addition, Internal Audit assists in ensuring internal control effectiveness. Moreover, external auditors in particular ensure that financial information is correct in this respect. Internal guidelines are used to support operational management and compliance with these guidelines is subject to continuous supervision. In 2016, the Group updated its internal control guidelines and specified the set of instructions related to internal control practices. The Supervisory Board's Audit Committee, in particular, has a major role in ensuring that internal control performs effectively and in compliance with regulation. Internal control observations, recommendations given to the business line/division concerned and the progress of the implementation of such recommendations are reported to the Committee on a regular basis. Internal Audit is responsible for Group-level internal auditing within OP Financial Group. Internal audit is based on an independent and objective assessment, assurance and consulting activities. Internal Audit helps OP Financial Group to reach its objectives by bringing a systematic, disciplined approach to evaluating and improving the effectiveness of risk management, supervision and governance processes. Internal audit is conducted in compliance with good internal auditing practice. The International Standards for the Professional Practice of Internal Auditing, issued by the Institute of Internal Auditors, and professional standards, issued by the Information Systems Audit and Control Association, and the code of ethics provide the conceptual framework for good internal auditing practice and the independence of objectivity of internal activities. The planning, implementation and reporting of audit are an independent function. Internal audit performance is subject to external quality assessment every five years. Internal Audit reports on audits to the Audit Committee of the central cooperative’s Supervisory Board. It has no operational responsibility or powers with respect to the functions subject to auditing. The Supervisory Board of OP Cooperative confirms the operating principles of OP Financial Group’s Internal Audit. The Supervisory Board’s Audit Committee adopts the Internal Audit action plan. The Chief Audit Executive regularly reports his/her audits and any resulting observations to the Supervisory Board’s Audit Committee. Furthermore, the central cooperative’s Executive Board discusses his/her observations. Approved by the central cooperative's Supervisory Board, the Internal Audit action plan for 2016 covered audits performed in both the central cooperative consolidated and Group member cooperative banks. The audits focused on the identification of risk factors and the assessment of the performance of internal control processes. In its reports, Internal Audit issues recommendations for remedying any defects discovered. Internal Audit performed audits according to the action plan and reported the audits to the Audit Committee of the Supervisory Board, the Executive Board of the central cooperative consolidated, the management teams of business segments and certain functions and subsidiaries' boards of directors as well as, with respect to Group member cooperative bank audits, to the banks' management. Internal Audit regularly monitored the progress of the implementation of the recommendations issued on a half-yearly basis and regularly reported its monitoring observations to the Supervisory Board's Audit Committee and the management of the central cooperative consolidated. Managing compliance risks forms part of internal control and good corporate governance practices and, as such, an integral part of business management duties and the corporate culture. Responsibility for regulatory compliance and its supervision within OP Financial Group entities rests with the senior and executive management and all supervisors and managers. In addition, everyone employed by OP Financial Group is responsible for his/her own part for regulatory compliance. The Compliance function assists senior management and executive management and business lines/divisions in the management of risks associated with regulatory non-compliance, supervises regulatory compliance and, for its part, develops internal control further. Guidelines, advice and support concerning compliance activities within OP Financial Group are the responsibility of the Compliance unit within the Internal Control Support department of the risk management function independent of the central cooperative. Group member cooperative banks have their own designated compliance officers. Control, support and supervision of compliance activities for member cooperative banks are performed through the network of contact persons formed by the designated compliance officers. As part of the central cooperative’s Risk Management, the OP cooperative banks’ operational risk management and compliance support supports the attendance of compliance duties at OP cooperative banks. Any observations made within compliance are reported regularly to the business line/division concerned, OP Cooperative's Executive Board and the Supervisory Board's Risk Management and Audit Committees. In 2016, risk-based focus areas in compliance continued to include, as in prior years, KYC regulation and ensuring compliance with legislation and official instructions related to the provision of investment services and with related Group-level guidelines and the performance of processes. Compliance advisory activities and business support also focused on solving any problems emerged from regulatory compliance related to KYC and investment services. The same risk-based prioritisation was also observed in providing support related to training for business lines/divisions. Training is also aimed at enhancing knowledge of Group and entity-specific guidelines. During 2016, OP Financial Group prepared a risk assessment relating to AML/CTF. Furthermore, it prepared a new system-supported internal control tool that enables the control of the performance of the duties of supervisory control at Group level. The Group developed follow-up related to future regulatory changes and preparing for these. The aim was to improve the conditions of the business lines/divisions to prepare for upcoming regulatory changes and to ensure that they take measures required by the changes before they enter into force. Particular attention was paid to the EU Data Protection Regulation, the transposition of the 4th Money Laundering Directive into national law and the progress of the preparedness for MiFID II legislation. Compliance activities and observations were regularly reported to the entities' and Group's senior and executive management in accordance with the Group-level guidelines. OP Financial Group's mission and core values as well as strategic goals and financial targets form the basis for risk management and capital adequacy management. The strategy outlines the Group’s risk appetite and risk management priorities that help to ensure strategy implementation. The objective is to help achieve the targets set in the strategy by controlling that risks taken are proportional to risk-bearing capacity. Risk and capital adequacy management falls under internal control. Its purpose is to ensure the risk-bearing capacity and liquidity of OP Financial Group and its entities and, thereby, ensure business continuity. Risk and capital adequacy management has been integrated as an integral part of the Group's business and management. Risk-bearing capacity is made up of effective risk management that is proportionate to the extent and complexity of operations and of adequate capital resources and liquidity based on profitable business operations. The most significant risks of OP Financial Group include credit risks, market risks, liquidity risks, underwriting risks, concentration risks and strategic and operational risks, including compliance risks associated with all business operations, and reputational risk. OP Financial Group adopts a policy of moderate risk-taking. OP Financial Group’s principles governing the risk-taking and risk tolerance system, adopted by the central cooperative’s Supervisory Board, define how the Group’s risk-taking is controlled, restricted and supervised and how the risk management and internal capital adequacy assessment process is organised. Allocating capital and liquidity systematically by business segment in line with current and planned risk-taking. In OP Financial Group's risk policy, the central cooperative's Executive Board confirms annually risk-management principles, actions, objectives, limits and control limits to be applied by all Group business segments and entities that are used to guide business to implement the policies confirmed in the Group's strategy and the principles of the risk tolerance system. Confirmed annually by the central cooperative's Supervisory Board, risk limits ensure that OP Financial Group does not take excessive risks to jeopardise its capital adequacy, profitability, liquidity and business continuity. The Executive Board annually confirms limits for the central cooperative consolidated's entities and control limits for Group member cooperative banks derived from the Group's limits. 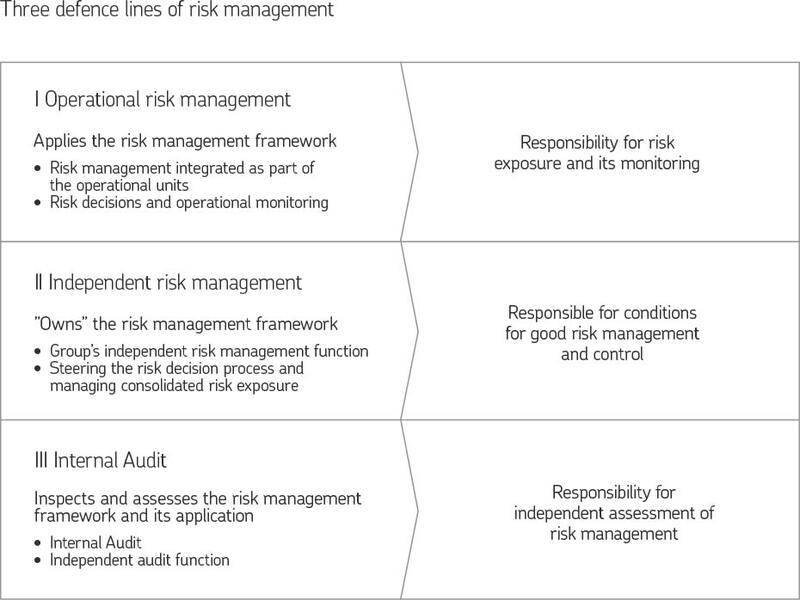 The organisation and responsibilities of the Group's risk management and capital adequacy management are founded on three lines of defence shown below. The first line consists of risk management applied within business and other operations. It supervises risk decisions and ensures that risk exposure and risk-bearing capacity are under sufficient entity-level control. Risk management is included in business models and processes. The second line of defence consists of risk management independent of operational business organisations that is run from the central cooperative. It is in charge of the Group's risk management framework, supervises the risk-decision process and is responsible for the Group's consolidated risk exposure and risk-bearing capacity monitoring. The third line of defence is centralised internal audit. It audits and evaluates both the Group's risk management framework and its application in the central cooperative and other Group entities. In risk management of the central cooperative, 2016 included monitoring external regulatory changes and continuing to prepare for regulatory changes. Significant changes relevant to OP Financial Group included the EU Solvency II Directive applying to insurance companies and the EBA (European Banking Authority) technical guideline on the management of interest rate risk in the banking book effective since the beginning of 2016. The Group continued to further develop its risk management assessment processes and operational processes in order to ensure that risk management has been integrated as part of all business. In addition, the Group updated its risk management guidelines, risk reporting and risk limitation. Risk Management has also developed significantly OP Financial Group’s internal stress testing methods. OP Cooperative has one auditor, which must be a firm of authorised public accountants certified by the Finland Chamber of Commerce. The auditor shall also audit the consolidated financial statements as referred to in Section 9 of the Act on the Amalgamation of Deposit Banks. The Cooperative Meeting shall elect the auditor. The term of office of the auditor expires upon the closing of the Annual Cooperative Meeting following its election. The Audit Committee of OP Cooperative's Supervisory Board puts audit services out to tender at some five years’ interval (last time at the end of 2011), on the basis of which it proposes eligible auditors to the Annual Cooperative Meeting. The auditor's remuneration is based on the invoiced amount. The auditors are tasked with auditing the accounting, financial statements and governance of OP Financial Group and its entities and sub-groups in order to obtain assurance that the Group and its entities and administrative bodies act in compliance with applicable laws and that the financial statements have been prepared in compliance with the rules and regulations in force and give OP Cooperative's shareholders and other stakeholders a true and fair view of the financial position, financial performance and cash flows of the Group. In addition, the auditors regularly issue other statements on the basis of specific regulation applicable to the sector. The Supervisory Board’s Audit committee annually assesses the quality of the auditor’s performance and ancillary services and the independence of auditors and the statement of the ancillary services. The auditors annually issue the Auditor's Report to the members of OP Cooperative in which they express their opinion on the financial statements and the Report by the Executive Board. 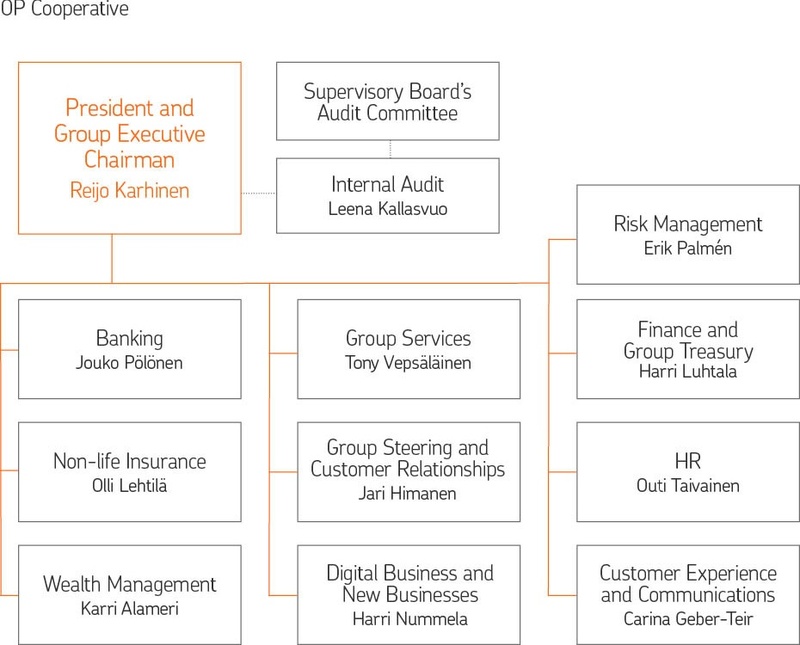 Based on their observations, they also draw up audit memoranda delivered to the OP Cooperative's Executive Board, the President and Group Executive Chairman, the Supervisory Board's Audit Committee, the CRO, Internal Audit and the Finnish Financial Supervisory Authority, according to the subject matter concerned. Whenever necessary, auditors also issue oral reports to the aforementioned persons and bodies. The Supervisory Board's Audit Committee consults the auditor when dealing with the Group's annual accounts and interim accounts, as well as the accounting policies. The auditors have a statutory obligation to notify the Financial Supervisory Authority of any matters or decisions that put operations and the existence of licence requirements at risk, or that result in an opinion in the Auditor’s Report other than the unqualified opinion, as referred to in the Auditing Act, or result in an auditors’ remark as referred to in Chapter 3, Section 5 and Paragraph 4 of the Auditing Act. KPMG Oy Ab, a firm of authorised public accountants, has acted as OP Cooperative's auditor since 2002, with authorised public accountant Raija-Leena Hankonen as the Chief Auditor since 2014. KPMG Oy Ab, a firm of authorised public accountants, acts as the auditor of OP Cooperative Consolidated, i.e. the central cooperative consolidated, with auditors appointed by KPMG Oy Ab acting as chief auditors. Auditors acting as OP Financial Group member cooperative banks' auditors also include other firms of authorised public accountants and authorised public accountants, in addition to KPMG Oy Ab. Audit is based on audit plans. Statutory audit of separate companies and their groups involves the audit of the entity's accounting, financial statements, report by the board and governance for the financial year. Aspects relevant to statutory audit included receivables from customers, investment assets and derivative contracts, insurance liabilities and the control environment related to financial reporting as well as information systems. All interim reports and financial statements bulletins are unaudited. OP Cooperative Consolidated has used KPMG Oy Ab's advisory services related mainly to the comfort letters of bond programmes, ISAE 3402 verifications from centralised services, structural changes in the central cooperative as well as tax services and counselling. Audit fees for statutory audit are based on an annual plan. Audit fees paid to auditors totalled EUR 1.9 million (2.2), whereas assignments as referred to in Chapter 1, Section 1(1) of the Auditing Act totalled EUR 0.2 million (0.3), fees for legal counselling EUR 0.1 million (0.0) and fees for other services EUR 0.7 million (0.7). The amalgamation comprises OP Cooperative as the central cooperative together with its member credit institutions and financial institutions and service companies over which they exercise control. OP Cooperative controls the amalgamation's operations and provides the companies within the amalgamation with guidelines for risk management, good corporate governance and internal control with the aim of safeguarding their liquidity and capital adequacy. The central cooperative may also confirm general principles to be followed by the member credit institutions in operations relevant to the amalgamation. In addition, the central cooperative supervises the operations of its member credit institutions in the manner as referred to in the Act on the Amalgamation of Deposit Banks. OP Financial Group as a credit institution is supervised by the European Central Bank (ECB). The Finnish Financial Supervisory Authority oversees OP Financial Group's investment firms and insurance companies in Finland as prescribed in legislation governing financial and insurance markets. OP Financial Group's operations in Estonia, Latvia and Lithuania are supervised to an applicable extent by the national regulators. The different financial management units subordinate to OP Financial Group's CFO take charge of not only the preparation of interim and annual accounts for OP Financial Group and Group entities, as required by financial accounting, but also of the production of management accounting reports, such as monthly reports on business performance. The Control function within OP Financial Group also produces earnings forecasts and analyses the actual outcome in comparison with the forecasts and reports on any deviations. This chapter, Financial reporting process, describes the main features of how OP Financial Group’s internal control and risk management work with a view to ensuring that the consolidation group’s financial reports give substantially true information on the company’s and its consolidation group’s financial performance and position. Group-level financial information correctly consolidated using sub-ledger accounting and OP Financial Group companies’ information forms the basis of reliable financial reporting. OP Financial Group uses Group-wide financial reporting and risk reporting to monitor the achievement of its business goals and financial targets, and these reports are regularly reviewed at executive management and OP Cooperative's Executive Board meetings. Financial information in financial reports is compared with related plans and any differences are analysed and the report also describes earnings outlook for the current year and for a longer period of time. The very same principles apply to the monthly financial performance and risk report prepared by the management. When preparing and examining the report, the management ascertains the accuracy and correctness of the financial results and reporting by analysing the performance and risk exposure and any deviations from targets. External reporting is based, for example, on the International Financial Reporting Standards, the Finnish Limited Liability Companies Act, the Act on Credit Institutions, the Insurance Companies Act, the Accounting Act, and the standards and regulations issued by the Financial Supervisory Authority. OP Financial Group’s shared principles are applied in the accounting, financial statements and consolidated financial statements of OP Financial Group companies. Responsibility for the interpretation of, guidelines on and advice on standards, other laws governing the preparation of financial statements and official accounting requirements as well as the preparation of and compliance with common accounting policies rests with OP Cooperative, OP Financial Group’s central cooperative. Whenever necessary, OP Cooperative turns to auditors who give a statement of the selected principles and interpretations. OP Cooperative's Executive Board is the highest decision-making body in matters associated with business control. The Executive Board must ensure that supervision of accounting and treasury is duly organised. It decides on reporting, procedures and qualitative and quantitative indicators used to assess operational efficiency and performance, discusses and approves the consolidated financial statements and interim reports. monitoring the financial statements process and supervising the financial reporting process as well as assessing the accuracy of financial reporting and its regulatory compliance. The President and Group Executive Chairman must ensure in accordance with the Co-operatives Act that the company's accounting is in compliance with applicable laws and treasury has been organised in a reliable manner. The OP Cooperative Finance and Group Treasury function is in charge of OP Financial Group's financial reporting. The Group has centralised the preparation of financial statements and interim reports independent of business lines/divisions. OP Financial Group's shared systems are primarily used in reporting. Operational duties related to financial and management accounting have also been centralised at central cooperative consolidated level. As provided by law, auditors shall assess the accuracy of financial reporting. The auditors are tasked with auditing the accounting, financial statements and governance of the company and its consolidation group in order to obtain assurance that the Company and its administrative bodies act in compliance with applicable laws and that the financial statements have been prepared in compliance with the rules and regulations in force and give owners and other stakeholders a true and fair view of the financial performance and the financial position of the Company and its consolidation group. In its audits or processes, Internal Audit also assesses, when applicable, the effectiveness and adequacy of financial reporting, and reports these audits to the executive management and the Supervisory Board's Audit Committee. During its inspections, the Financial Supervisory Authority also oversees the financial reporting process and its effectiveness. As part of the independent financial reporting assessment, auditors supplement the actual audit by inspecting the planning and effectiveness of controls within centralised functions according to ISAE 3402. Auditors report separately on this specific audit in accordance with this standard. OP Financial Group's financial statements were prepared in accordance with IFRS, applying IASs, IFRSs and SIC and IFRIC interpretations effective on 31 December 2016. Amendment to IAS 1 was aimed at enhancing the understandability of financial statements by focusing on presenting relevant items. The adopted new income statement and balance sheet format better reflects the current business model than the previous one. In addition, OP Financial Group has removed irrelevant information from the notes. Annual improvements to IFRS for cycles 2012‒2014 (applicable mainly to accounting periods beginning on or after 1 January 2016.) Minor amendments are annually made to standards through the Annual Improvements process. The effects of the amendments vary by standard but they are not significant. In addition, amendments have been made to IFRS 10, IFRS 11, IFRS 12, IAS 16, IAS 28 and IAS 38, effective since 1 January 2016. The amendments did not have any major effect on OP Financial Group’s financial statements. In addition to the standards adopted, the grouping of the income statement and balance sheet formats has been revised in the financial statements. This has no effect on equity capital, balance sheet total or profit for the financial year. Segment reporting has been updated accordingly. Comparatives have been restated to correspond to the new grouping. Within OP Financial Group, financial remuneration consists of fixed and variable remuneration. Variable remuneration involves both short-term and long-term performance-based bonuses. A sufficiently large amount of the total remuneration must remain fixed. The proportion of variable remuneration may not exceed 100% of the total amount of each beneficiary's fixed remuneration. OP Cooperative's Supervisory Board defines this appropriate, reasonable balance between the fixed and variable pay. Variable remuneration comprises a long-term management remuneration scheme common to OP Financial Group member cooperative banks and the central cooperative consolidated and the personnel fund for all personnel as well as short-term schemes for each target group. In its remuneration, the Group complies with provisions based on EU and national laws and guidelines issued by the European Central Bank, the Finnish Financial Supervisory Authority and other regulators. Remuneration policies governing OP Financial Group’s employees and management are based on laws, provisions and recommendations applicable to the financial sector and on the Finnish Corporate Governance Code. OP Financial Group’s remuneration policy is consistent with sound and effective risk management and does not encourage excessive risk-taking. The remuneration schemes are in line with the core values, goals and targets, and the business strategy, and agree with the Group’s long-term interests. Remuneration may not lead to a situation that could jeopardise the general reliability of the incentive scheme, an owner-customer's or customer's interests or the reputation of OP Financial Group or a Group company. OP Cooperative's Supervisory Board and, depending on the matter concerned, OP Financial Group's Remuneration Committee, the Supervisory Board's presiding officers or the Nomination Committee of the central cooperative’s Executive Board and boards of directors as well as the relevant Remuneration or HR Committee, which reviews the application of the schemes and asses their effectiveness, deal with remuneration principles and policy lines within OP Financial Group. For schemes applying to the entire Group, the decisions are made by the Supervisory Board or OP Financial Group's Remuneration Committee. A Supervisory Board member, who has no employment or executive contract with an OP Financial Group company, may be a Remuneration Committee member. Within the member cooperative banks, remuneration-related decisions are ultimately made by each bank's board of directors. The Supervisory Board of OP Cooperative shall approve the Group's remuneration principles, decide on the long-term incentive scheme, confirm the general terms and conditions of the Group’s remuneration schemes and issue recommendations for short-term incentive schemes. The Supervisory Board owns the long-term management remuneration scheme and decides on its metrics, target levels and maximum bonuses. 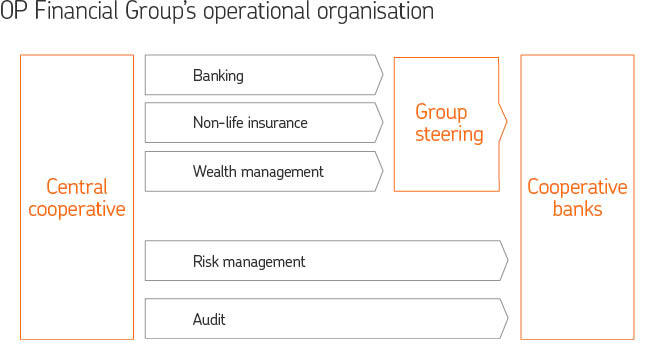 Similarly, the Supervisory Board determines the metrics, target levels and maximum bonuses in respect of OP Financial Group’s personnel fund as well. The presiding officers of the Supervisory Board decide on issues related to OP Cooperative Executive Board remuneration. By order of the Supervisory Board, OP Financial Group's Remuneration Committee set up by the Supervisory Board shall monitor and supervise the effectiveness and competitiveness of the remuneration schemes and the ability of the remuneration structures to support the Group’s long-term goals and targets. The Remuneration Committee shall annually approve and revise the Group’s remuneration policies. The HR Committee of OP Cooperative's Executive Board and the presiding officers of OP Cooperative's Supervisory Board act as bodies in charge of preparing remuneration issues. The Remuneration Committee of OP Financial Group acts as a body in charge of preparing remuneration issues for Group member cooperative banks’ management. Internal Audit reviews annually compliance with the remuneration and incentive scheme approved by the Supervisory Board. OP Financial Group's Remuneration Committee annually issues a recommendation to member cooperative banks on management remuneration. Such statement involves a recommendation on monthly emoluments and meeting attendance allowances of chairmen and members of member cooperative banks' supervisory boards and boards. The Cooperative Meeting decides on emoluments and other benefits payable to the members of OP Cooperative's Supervisory Board. Monthly emoluments for 2016 confirmed by the Cooperative Meeting and payable to the Supervisory Board Chair, Vice Chairs and members are as follows: Chair 6,600 euros, Vice Chair 3,300 euros and other members 400 euros. Chairs other than those of committees acting under the Supervisory Board Chair receive 1,650 euros in monthly emoluments. In addition, all Supervisory Board members receive an attendance allowance of 600 euros for each meeting. Management and administration emoluments are paid in cash. The Chair, Vice Chairs and members of the Supervisory Board are covered by voluntary pension insurance, as referred to in the Employees’ Pensions Act (395/2006), through OP Bank Group Pension Fund. The Nomination Committee of OP Cooperative's Supervisory Board determines the remuneration and other benefits to OP Financial Group's President and Group Executive Chairman, and other Executive Board members, deputy members and the Chief Audit Executive. A written executive contract, approved by the Supervisory Board, stipulates the terms governing the President and Group Executive Chairman's employment. His remuneration consists of the following three parts: 1) Basic pay (salary and fringe benefits, based on the job grade, skills and performance); 2) short-term remuneration based on short-term performance (performance-based bonuses, based on the achievement of targets under the annual plan); and 3) long-term remuneration (OP Financial Group’s common management remuneration scheme, based on the achievement of the Group’s shared strategic goals and targets). The President and Group Executive Chairman's retirement age is 63. Pension benefits are determined in accordance with pension laws and OP Financial Group’s own pension plans. The President and Group Executive Chairman is covered by OP Bank Group Pension Foundation’s supplementary pension scheme. Pension accrued under the supplementary pension scheme may begin to be disbursed as a paid-up pension before the old-age pension if employment with OP Financial Group terminates. The period of notice applicable under the President and Group Executive Chairman’s executive contract is six months. Upon termination of employment in cases specifically stipulated in the executive contract, the executive is entitled to a severance pay and a sum equivalent to his 12 months’ pay. The Nomination Committee of OP Cooperative's Supervisory Board determines the remuneration and other benefits to OP Cooperative's Executive Board members, deputy members and the Chief Audit Executive. A written executive contract, approved by the Supervisory Board, stipulates the terms governing each of the above-mentioned persons' employment. Remuneration payable to the members and deputy members of OP Cooperative's Executive Board and the Chief Audit Executive consists of the following three parts: 1) Basic pay (salary and fringe benefits, based on the job grade, skills and performance); 2) short-term remuneration based on short-term performance (performance-based bonuses, based on the achievement of targets under the annual plan); and 3) long-term remuneration (OP Financial Group’s common management remuneration scheme, based on the achievement of the Group’s shared strategic goals and targets). The Board members, deputy members and the Chief Audit Executive retire at 63. Pension benefits are determined in accordance with pension laws and OP Financial Group’s own pension plans. Executive Board members' supplementary pension cover has been arranged through OP Bank Group Pension Foundation and supplementary pension taken out with OP Life Assurance Company. The period of notice followed by the employer for Executive Board members, deputy members and the Chief Audit Executive is 6 months. Upon termination of their employment in cases specifically stipulated in their executive contracts, Executive Board members are entitled to a severance pay and a sum equivalent to a maximum of 6 months’ pay. Short-term remuneration is aimed at guiding, engaging and encouraging employees to achieve annual goals and targets and perform successfully, ensuring the achievement of the goals and targets deriving from the strategy, and rewarding them for achieving and exceeding challenging targets. The short-term remuneration schemes are based on metrics deriving from annual targets. Such metrics may be determined at Group-, company-, department- and employee level. Bonuses based on the short-term scheme come from achieving or exceeding the targets set for the metrics. In addition to personal performance, bonus payout requires the fulfilment of the conditions set for Group- and/or company-level remuneration. Every OP Financial Group member cooperative bank decides for its part the objectives and metrics of short-term remuneration on the basis of the recommendations issued by OP Cooperative's Supervisory Board. OP Cooperative's Executive Board determines remuneration for the central cooperative consolidated and the board of directors of each central cooperative consolidated entity confirm the inclusion of the entity in the remuneration scheme of the central cooperative consolidated. Short-term bonuses are mainly paid in cash. With respect to its identified staff, OP Financial Group complies with the legal requirements for the deferral of bonuses and their payment using an instrument other than cash in case variable remuneration exceeds a defined level. Within each organisation, the decision-making body in charge of the remuneration scheme may change their terms and conditions of the short-term scheme, cancel it during the year or defer the payment of bonuses if there has been a change in circumstances which would place the company in an unreasonable situation were the scheme implemented. A Group member cooperative bank or the central cooperative consolidated may withhold payment of bonuses partly or fully citing its financial position. Paid bonuses may also be fully or partly reclaimed if the recipient is found guilty of misdemeanours, of intentionally endangering the future of business, or of breaking the law. OP Financial Group's shared long-term management remuneration scheme consists of three performance periods. The first period covered 2011–2013 and the one 2014–2016. The third performance period started at the beginning of 2017, covering 2017–2019. The long-term management remuneration scheme has Group-level targets. The primary performance metrics for the performance period of 2014–2016 include growth in the number of customers using OP as their main bank and insurer, OP Financial Group’s EBT and Common Equity Tier 1 (CET1) ratio. In addition, the scheme takes account of profitability (return on economic capital) and capital adequacy under the Act on the Supervision of Financial and Insurance Conglomerates. No bonus will be paid if capital adequacy under said Act is less than the minimum 130% on the date of payout. Some 320 OP Financial Group employees are included in the long-term management remuneration scheme for the performance period of 2014–2016. Those included in the long-term management remuneration scheme for 2014–2016 may receive a specified quantity (staggered according to the job position) of debentures issued by OP Corporate Bank plc if the strategic targets set for OP Financial Group are met during the performance period in question. The bonus based on the scheme will be paid out to the beneficiary in terms of debentures and cash and in three instalments in 2018, 2019 and 2020 after the performance period, provided that OP Financial Group’s capital adequacy is higher than the minimum requirement on the payout date. Taxes and tax-like charges incurred by the beneficiary will form the portion paid in cash. Bonus payout includes conditions relating to the duration of employment or executive contracts and stipulations governing the hedging prohibition and the retention period. The hedging prohibition refers to a prohibition against use of financial instruments or insurance under the incentive scheme for hedging personal risks. The retention period means that the beneficiary must hold the debentures that he has received under the scheme for one year from the payout date. The long-term remuneration scheme for other employees is based on OP Financial Group Personnel Fund. Membership of the Fund is based on an employment contract. All those who have concluded an employment contract for an indefinite or fixed term with an OP Financial Group company belonging to the Fund are members of the Fund (excl. those included in the long-term management incentive scheme). This long-term remuneration scheme is grounded on the achievement of OP Financial Group’s shared strategic goals and targets. The Group-level targets and performance metrics under the scheme based on the Personnel Fund are congruent with the targets under the long-term management remuneration scheme. The board of directors of the company belonging to OP Financial Group’s Personnel Fund shall annually decide on the amount of profit-based bonuses transferred to the Fund. Information required by the EU capital requirements regulation and directive concerning the remuneration of OP Financial Group's identified staff are published annually on OP's website. In 2016, OP Financial Group’s President and Group Executive Chairman received EUR 754,392 in salary, EUR 18,480 in fringe benefits and EUR 218,838 in bonuses for 2015 based on the short-term scheme, i.e. a total of EUR 991,710. In 2016, the amount of deferred bonuses earned for 2011, 2012, 2013 under the short-term and long-term schemes totalled EUR 628,658. Other Executive Board members, deputy members and the Chief Audit Executive received a total of EUR 3,430,193 in salary and EUR 161,997 in fringe benefits. The amount of bonuses earned for 2011–2015 under the short-term and long-term schemes totalled EUR 2,352,938. Salaries and bonuses paid to other Executive Board members, deputy members and the Chief Audit Executive totalled EUR 5,945,128. Salaries and bonuses include the amount of the performance-based bonuses earned for 2012, 2013 and 2015 and paid in 2016. Payment of performance-based bonuses earned by the President and Group Executive Chairman and Executive Board members for 2015 under the short-term scheme has not been deferred. The deferral procedure is based on a procedure prescribed in the Act on Credit Institutions (610/2014), which is described in Note 53 of OP Financial Group's 2016 IFRS Financial Statements on variable remuneration. The President and Group Executive Chairman, the other Executive Board members, deputy members and the Chief Audit Executive retire at 63. Pension benefits are determined in accordance with pension laws and OP Financial Group’s own pension plans. Supplementary pension insurance payments for 2016 totalled EUR 829,698. In 2016, no costs were recognised under the OP Bank Group Pension Foundation supplementary pension scheme. Supplementary pension costs have been published in the credit institutions’ remuneration data collected annually by the European Banking Authority (EBA) in accordance with the capital requirements regulation (EU 575/2013) and directive of the (2013/36/EU, CRD IV) of the European Parliament and of the Council. The period of notice for the President and Group Executive Chairman, other Executive Board members, deputy members and the Chief Audit Executive is 6 months. Upon termination of employment in cases specifically stipulated in their executive contracts, the President and Group Executive Chairman is entitled to a severance pay and a sum equivalent to a maximum of 12 months’ pay, while other Executive Board members, deputy member and the Chief Audit Executive are entitled to a sum equivalent to a maximum of 6 months' pay. * Include the amount of performance-based bonuses earned for 2012 and 2013 and paid in 2016 as well as the amount of long-term performance-based bonuses earned for 2011–2013 and paid in 2016. Payment of deferred amounts requires a separate decision. Entities providing OP Financial Group's investment service, such as member credit institutions, have their own Guidelines for Insiders and Insider Trading. The Guidelines contain regulations governing inside information, prohibition against abuse and improper disclosure of inside information, public insider registers, non-public lists of insiders, list of executives as well as reporting and disclosure of transactions, trading restrictions applicable to insiders as well as insider management. The Guidelines also cover restrictions imposed on relevant persons and the organisation of supervision of compliance with the restrictions. In addition, OP Corporate Bank plc and OP Mortgage Bank as OP Financial Group's issuers of securities have their own equivalent guidelines. Those with access to inside information on securities issued by OP Corporate Bank plc and OP Mortgage Bank are included in the non-public company-specific insider lists of these companies. Insider management also maintains the lists of the executives of OP Financial Group’s securities issuers OP Corporate Bank plc and OP Mortgage Bank. The Guidelines for Insiders and Insider Trading are based on laws governing securities markets, regulations issued by the Finnish Financial Supervisory Authority and the recommendation for listed companies’ insider guidelines issued by Nasdaq Helsinki. The Guidelines are aimed at fostering stock market players' trust in OP Financial Group, OP Corporate Bank and OP Mortgage Bank. OP Legal Services maintains the public insider lists and company-specific insider lists of OP Financial Group entities. Such maintenance is organised through the SIRE system maintained by Euroclear Finland Ltd and through OP Financial Group’s SIPI system. OP Legal Services manages the practicalities related to maintaining the lists. Whenever necessary, OP Financial Group companies keep project-specific insider lists. As credit institutions, OP Financial Group’s member cooperative bank operations include participation in securities trades performed by clients or in other transactions related to securities. In connection with financing arrangements or as part of the bank’s other ordinary operations, member cooperative banks and their executives and salaried employees may also receive inside information on client companies. For the abovementioned reasons, among other things, member cooperative banks and their executives and salaried employees are subject to insider regulation as referred to in the applicable law. Training in insider issues is available on a regular basis. In particular, training takes place as a result of changes in the insider-related guidelines. Anyone has the right to access the public register of insider holdings and receive extracts and copies of the information in the register against a charge. However, a natural person’s personal ID code and address and the name of a natural person other than the insider are not publicly available. Information included in the list of permanent insiders is not publicly available. Extracts from and copies of the public insider register can be ordered from Wealth Management Legal Support, OP Legal Services. 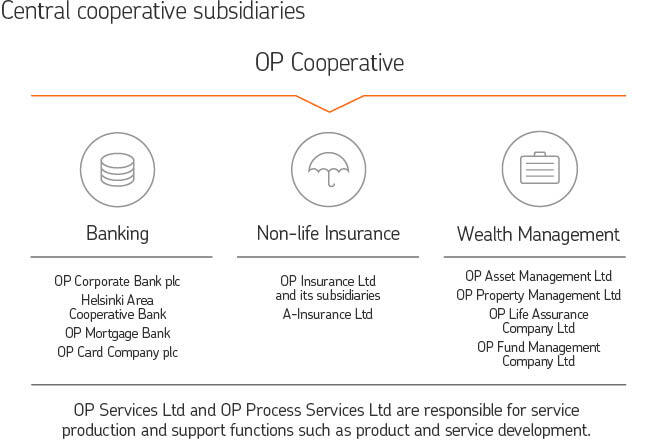 OP Cooperative's subsidiaries OP Corporate Bank plc and OP Mortgage Bank are in charge of OP Financial Group's funding from money and capital markets. Securities issued by OP Financial Group entities are traded on the London Stock Exchange, SIX Swiss Exchange or other stock exchanges, in addition to or in place of Nasdaq Helsinki. OP Corporate Bank has also issued unlisted bonds and/or certificates of deposit the Finnish, UK and Japanese markets. In their disclosure policy, OP Financial Group, OP Corporate Bank and OP Mortgage Bank comply with legislation, decrees and other binding regulations and the rules of Nasdaq Helsinki and, to the appropriate extent, those of other stock exchanges and the regulations and guidelines issued by the Finnish Financial Supervisory Authority and the European Securities and Markets Authority (ESMA). OP Financial Group's Communications takes into account not only the above but also the Corporate Governance Recommendations and the Code of Business Ethics. This disclosure policy approved by OP Cooperative's Executive Board on 14 June 2016 and the boards of directors of OP Corporate Bank and OP Mortgage Bank on 21 June 2016 applies to the disclosure principles and practices of bond issuers (OP Corporate Bank plc and OP Mortgage Bank) and OP Financial Group. It is the duty of OP Cooperative to ensure that OP Corporate Bank and OP Mortgage too disclose, distribute and make information available on matters covered by the disclosure obligation as prescribed by law. The subsidiaries report and publish their own interim reports, financial statements and reports by the board of directors. OP Cooperative discloses information for and on behalf of its subsidiaries that falls under its disclosure obligation. In practice, the central cooperative issues bulletins and releases in the name of OP Financial Group or the issuer. Communication with regard to securities issued by OP Corporate Bank and OP Mortgage is decided upon on a case-by-case basis with the issuer. Responsibility for the issuer's disclosure obligation rests with each issuer. The disclosure policy describes the key principles and policies followed by OP Financial Group and issuers in their communication with capital market participants and other stakeholders. In addition, the policy describes the disclosure, dissemination and storage of the information within the scope of the disclosure obligation as prescribed by law. OP Financial Group assesses its disclosure policy's consistency, suitability and sufficiency on a regular basis, at least once a year. OP Financial Group's communications are tasked with promoting the Group's business by providing all stakeholders with accurate information on the Group's goals, targets and operations. External and internal communications aim to support the Group's strategic and business goals and enhance and maintain the Group's strong corporate image while fostering cooperation within the Group. Both external and internal communications are based on facts and provide a true picture of the state of affairs. Disclosure Policy is available at www.op.fi. OP Financial Group's web address is www.op.fi. Corporate social responsibility (CSR) forms an integral part of OP Financial Group’s business and part of the Group’s strategy. The Executive Board of OP Cooperative decides on the CSR guidelines and approves the Group’s CSR programme. On the Executive Board, CSR falls within the area of responsibility of the Executive Vice President, Corporate Communications. In appointing Executive Board members, the Supervisory Board pays attention to the fact that the Executive Board has adequate CSR expertise. Performance assessment is based on the achievement of CSR KPIs reviewed regularly according to the Executive Board’s meeting cycle. CSR activities are guided by the CSR principles adopted by the central cooperative’s Executive Board. Responsibility for practical CSR activities rests with the boards of directors and executive boards of OP Financial Group companies, which implement corporate social responsibility in accordance with their own decision-making processes. Identity and Communications supports Group entities and functions in the implementation of the CSR programme and in the dialogue with stakeholders and, whenever necessary, may communicate their concerns to the Executive Board. OP Financial Group complies with the Code of Business Ethics approved by the Supervisory Board. OP Financial Group respects and conforms to international economic, social and environmental responsibility principles. The Group is committed to promoting the principles of the United Nations Global Compact initiative. OP Wealth Management has signed the UN Principles for Responsible Investment (UNPRI). OP Financial Group reports regularly on its corporate social responsibility issues according to the Global Reporting Initiative (GRI) guidelines. OP Financial Group’s Corporate Governance section, updated regularly, is available at op.fi.